Hello Thompsonville. We’re joining your party. We are delighted that we are finally getting the recognition we so richly deserve as Newton’s 14th village. 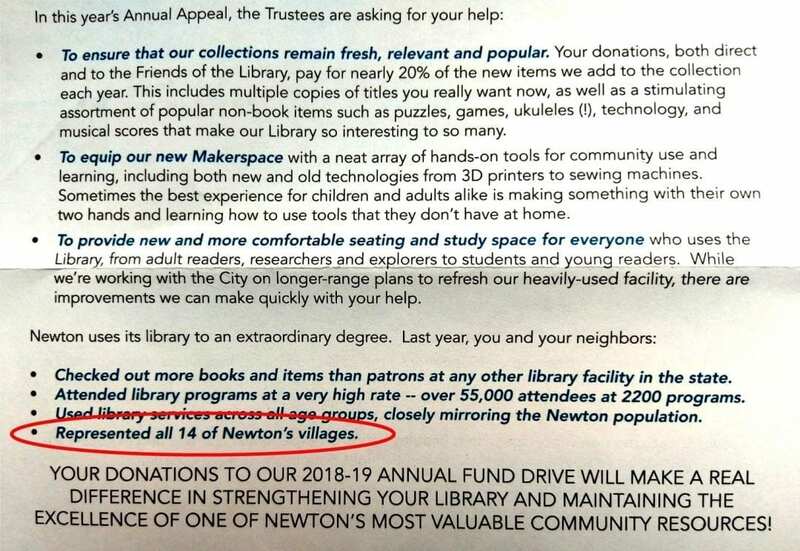 The Newton Free Library’s annual fundraising drive just made it official. Ok, now that that’s settled, we’re going to begin a signature drive to create a Village14 Area Council and we’re putting together a planning committee for our V14 Village Day. I’m looking forward to the spirited debates about where exactly the borders are between Village 14 and the adjoining villages. I want to be on the zoning committee. No banks, no nail salons, recreational pot for all! Only thing I want to know is which day is trash pickup. It depends! Come to the Holiday Selection Committee hearing, at 3 am next Wednesday at the Village 14 Social Club. Love it. No bans allowed. Actually, I propose a ban on bans. But I’m also open to considering a cap of no more than 2-4 bans. So this brings our city council up to 27 members? A cap of 2-4 bans would be allowing bans and would be controversial and confusing. @Doug. Sorry the historic Highlands village square has first dibs on the marijuana free zone with slot machines and roulette wheels thrown into the mix. We’ve had a secret planning committee working on this for months and will roll it out in style with a punk rock band at next year’s Village Day in June. “Get High in the Highlands” will be more than just an empty slogan. It will usher in a whole new cutting edge way of life. A Village14 eDay is a great idea! What could we do with it? Have the Mayor do an AMA? Contests like guess how many inches of snow Newton will get this year, with prizes? A “say something nice about the poster above you” thread? Will the “Village 14” Blog-site now change its name to “Village 15”? No definitely no name change in our future … but now that we’ve figured out how to create new real estate in this millionaire haven of a town, we’ll create new Village15 and Village16 sites and wait to be absorbed. It won’t be long before Village14 will be the old historic part of our eTown and the Village14 Historic Commission will review all future font changes in this historic district. I’m concerned about all the traffic Village 14 generates. Could be a parking and commuting nightmare!